USA: Miami did the trick! 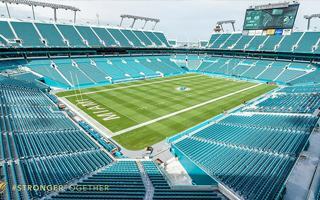 Today at 7pm local time Miami Dolphins will welcome their fans back into Sun Life Stadium. Not for NFL season yet, home opener comes on Sept 27. It’s the pre-season fixture against Atlanta Falcons that should test the redeveloped venue. It’s a major leap, perhaps even more clear under the stands, where brand new concessions and corporate facilities were created. Nearly every piece of old equipment got replaced by newer facilities. Structurally it’s the side stands’ lower tier that changed most. All of the old concrete was demolished and replaced by brand new sections of seating, far closer to the field. In fact, the stands were moved 10 rows towards the action. Some fans were reported to be furious as their former season ticket spots were replaced with luxury seating mimicking that from actual living rooms. But both all season tickets (47,000) and all luxury options (ranging from $400,000 to $600,000!) are now sold out. Of course it’s not the end for the Dolphins, only end of phase one. Second stage begins after the NFL season, when new roof structure (and giant screens) will be mounted on top of the stadium. One piece of bad news for the NFL franchise is the project’s growing price tag. Initially hoped to be as low as $350 million, it’s now around $425 million (€377m) and almost certain to grow further. That said, it’s still only a fraction of regular new stadium price in the league, almost commonly exceeding $1 billion.